Bake the pretzels for 8-10 minutes (5-6 for convection ovens) or until deeply browned. Brush the pretzels generously with melted butter and sprinkle with the toppings. I prefer a pinch of garlic powder followed by Italian herbs and/or parmesan cheese. Serve with dipping sauce, such as pizza sauce. Roll each section of dough into a rectangle about 2 ½ inches wide and as long as possible without ripping the dough. It is fine if the dough in rolled unevenly. Sprinkle a couple tablespoons of mozzarella in a thin line (about ½ inch wide) along the center of each rolled out dough section, keeping 1 ½ inches away from the ends. Sprinkle a small handful of pepperoni slices on top of the cheese. Carefully roll the dough, section by section to cover the fillings, pinching the seams to close. Form the filled dough into a ring, pinching the ends to close. Dip each pretzel into the soda wash and place on the prepared baking sheets. Let the pretzels rest for 10 minutes. Those look awesome. Now that we've tried bagels at our place, I think pretzels are the next natural thing to try! Hi Amy! 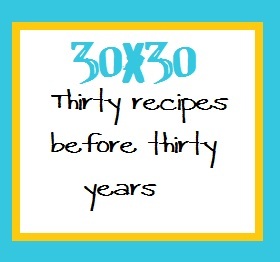 Glad you liked the recipe and were able to cross it off of your 30x30 list! Love that you stuffed them - it makes a perfect dinner! Oh yum. Pizza and pretzel. Heaven. I think you have a winner here because as Hubby was walking by my desk, he saw the picture and said, "Ooooh, look at that. You need to make those." Yup, great job! I used to order from this ridiculously expensive pretzel place to get my pretzel fix. I've never seen a recipe for my favorite pizza stuffed ones until now! YUM! Can't wait to try them! YUM! I've never made pretzels but I've always wanted to. These look DIVINE! I love making pretzels and this stuffed version looks great! Amy those look fantastic. I usually fail at stuffing things, but I might just have to try to concentrate really hard for these. :) Thanks for sharing. And thank you also for the delicious Avocado & Egg Grilled Cheese recipe...so incredibly tasty! I have made these before and we love them for snacks or a light lunch. These would be so fun to make! They look wonderful, good for you! I love your secret recipe club - can't wait for the day I have enough recipes to join! :) Looks like a tasty recipe too, mmm! I bet it was seriously fluffy inside! Soft Pretzels are my weakness and oh yes this recipe looks awesome! It is fun cooking with you in the SRC! Mmmm, I could eat about 5 of there right now :) looking fabulous! visiting from SRC! I have always wanted to try and make these you just inspired me! These look really good! Great pick for this months SRC! Making pretzels is on my bucket list, and I love that they don't use lye, which has always scared me. THANK YOU for sharing this amazing looking recipe. Check out my spaghetti pie. I've always wanted to make pretzels!